People tour of a water pumping station at 2530 Gross Point Rd. Ald. Robin Rue Simmons (5th) said the facility is similar to the one that will be constructed at 2525 Church St. Residents of the 5th Ward said they felt a “little better” after going on a tour of a water pumping station similar to the one that will be constructed near their homes in June. Ald. 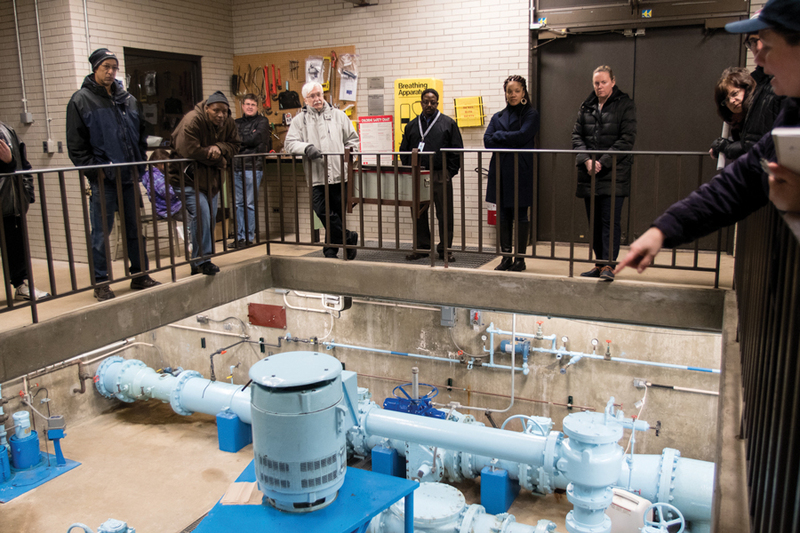 Robin Rue Simmons (5th) and city engineering and capital planning bureau chief Lara Biggs led 5th Ward residents on a tour of the water pumping station at 2530 Gross Point Rd. to show them what the station will look like and answer questions. Biggs told the crowd of about 10 people that the station on Church Street would not create significant noise pollution and there would not be excessive lighting on the building. She added that the facility will be under constant surveillance. She said the city negotiated with the water commission to have the facility constructed in a part of the lot that would cost them more but would be less obstructive to residents and allow other developments on the land. “(The decision to install the pumping station) was quicker than it normally would be, but after problems with Skokie we had to move quickly,” Biggs said, referring to an agreement between Skokie and the commission that fell through. Biggs said an Evanston capital improvements project will pay for the demolition of a vacant school building currently on the lot in late April. She added the Morton Grove-Niles Water Commission will pay for the construction and maintenance of the pumping station which is set to begin in June. Plans to construct recreational facilities on the lot, which will be an extension to Beck Park, are not definite yet. Rue Simmons told the group that constructing a splash pad, soccer field or bathrooms is still up for discussion. Resident Glenn Mackey said he would have appreciated more say in the decision to construct a water pumping station about 200 feet from his home. At the tour, Mackey said several of his neighbors who are senior citizens, object to the instillation of the water pump and the proposed recreational facilities at the site. Mackey told The Daily a task force that was assembled to oppose the pumping station has submitted an appeal to the city. Rue Simmons agreed, but added that she has to think about the other 8,000 residents of the 5th Ward. Rue Simmons said the pumping station will be a benefit to the city. She added that the revenue it will produce will mean the city won’t have to increase taxes or fines, and it won’t have to lay off employees or reduce services.